Google’s Keyword Tool was misleading for many people who were using it for Keyword Research when trying to see which Keywords were being searched for the most. The fact of the matter is that focusing on one Main Keyword Phrase will not get you to the top of the search engines. Your Home Page needs to focus on your Main Keyword Phrase, and every page you create should have it's own 'Related Keyword Phrase' that supports your Main Keyword Phrase. We have an easy guide on how to do this, and How To Use Google's Keyword Planner. The Keyword Tool used Broad Match Searches for keyword phrases when showing monthly search volumes. This led people to believe that a keyword phrase had a lot more searches than it actually did. This may explain why many people who got to the top of the search engines were surprised at how little traffic they were receiving. The chart below compares the search volumes of the Keyword Tool to the Keyword Planner for specific keyword phrases. You can see a dramatically higher volumes of searches when looking at the Keyword Tool, as compared to the Keyword Planner. Planner volumes. This is because the Keyword Tool would combine related keyword phrases to the specific keyword search. Taking the example of 'Donating A Car' it would also include the search volumes for 'Donate My Car' 'Donate A Vehicle' and so forth. 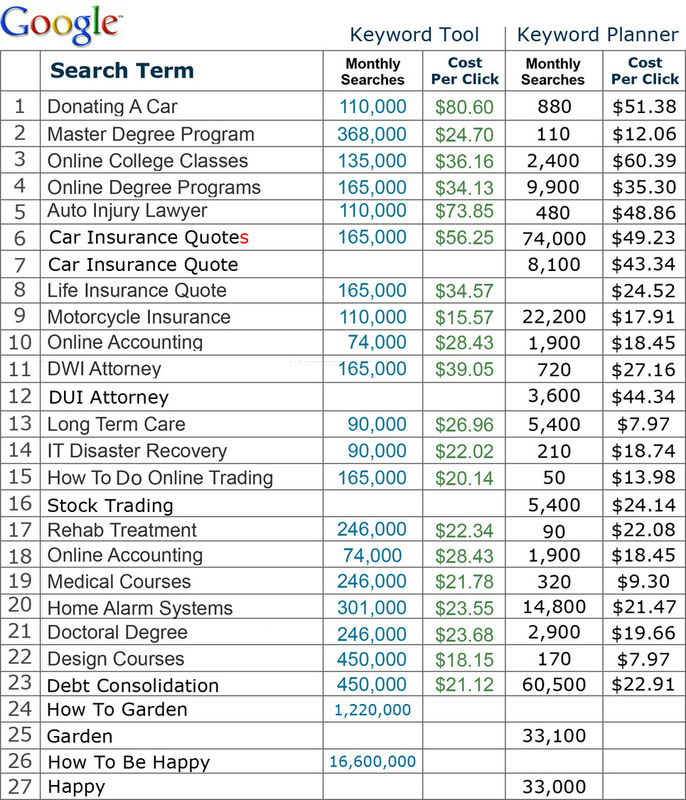 Using the Keyword Tool, a keyword phrase for a niche market according to some Internet marketers should have between 100,000 to 200,000 monthly searches. Using the Keyword Planner, the monthly search volumes are definitely lower. Now the monthly search volumes perhaps should target around 10,000 to 100,000. The predominant way of creating online wealth continues to be from 'Company Pay Models' such as pay per click links and leads. Pay Per Click Income Activator's allows you to have Your Own Pay Per Click Program, with your own advertisers. It tracks the clicks and creates the invoices automatically. Lead Generation Income Activator also allows you to Send Leads To Your Own Advertisers. It tracks the leads and creates the invoices automatically. You can use Income Activator's PPC and Referral programs as an add-on to your current website or blog, or use it as part of Income Activator's website builder. I personally believe that Google used the Keyword Tool to over state the number of searches it actually had as a strategic move to promote itself at the expense of people making business decisions based on this report volumes of monthly traffic based on searches. However, to Google's defense, the Keyword Tool was created to identify traffic volumes for their AdWords program, not for independent people making business decisions on broad matched search volumes.